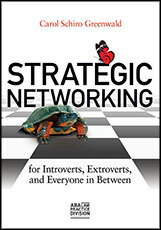 My book encourages lawyers to make significant, authentic networking connections with colleagues and prospects. Professional mingling presents challenges not only for the introvert—who may feel reluctant to pitch their business at a cocktail party or meeting—but also for the “hyper-extrovert” as well—who may enjoy casual conversations so much that they fail to forge deeper business relationships. To read a sample chapter from the book, click here. Click here for a sample chapter from the book. Editor of and Chapters Author in, Grow Your Practice: Legal Marketing and Business Development Strategies, New York State Bar Association, 2015. Author, Build Your Practice the Logical Way: Maximize Your Client Relationships [with Steven Skyles-Mulligan] First Chair Press, American Bar Association, 2012.